How to say Happy Mother’s Day to the Best Mom? 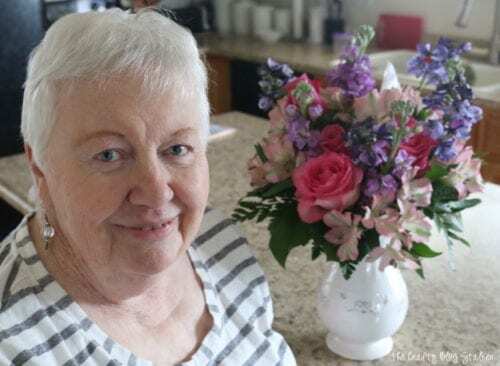 With love and a beautiful flower arrangement from 1800Flowers and a fun interview video. 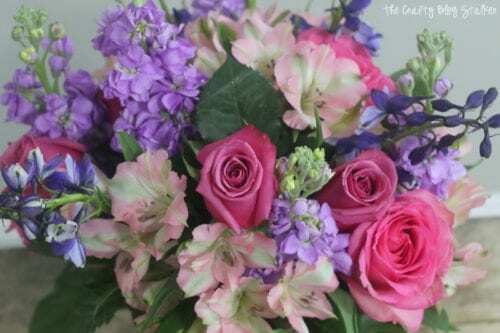 I received compensation from 1800Flowers.com for my participation through my relationship with the Quality Blue Community. All stories and opinions are my own. Mother’s Day is only a couple days away, and while I love my mom all year long, I wanted to do something special just for her. That is, I want to shout from the rooftops and tell her how much I love her. I love you, Mom! I have to tell you, my mom is one of that super-power, amazing moms. She raised 7 kids – yup that’s right, 7! See that cute little girl in the middle with pigtails? That’s me! I am the youngest (and most favorite) of the kids. The reason my mom is the Best Mom is because she laughs. Of course, she has other great motherly qualities, like she loves, and we all know that she would do anything she could to make anyone of us happy. But my favorite is her laugh. When my mom is laughing, she lights up a room with her joy. I know life was not easy for my mom and raising 7 children, but one thing I remember from every stage of my childhood is my mom’s laughter. As long as my mom was laughing, I knew everything was going to be okay and we would make it through. You can get a glimpse of my mom’s laugh in this fun little interview I did a couple days ago. This was so much fun to do and I was thrilled that she agreed even though it was out of her comfort zone. 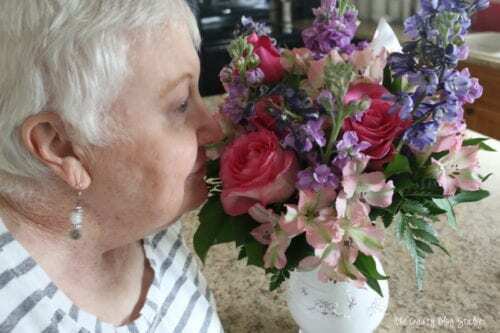 While nothing can compensate my mom for all she has done for me, I thought a beautiful bouquet of flowers from 1800Flowers might help me lock in the spot of favorite daughter. 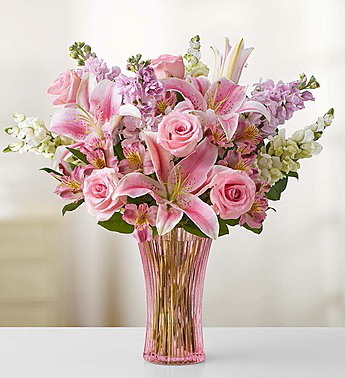 Ordering from 1800Flowers is so easy to do and the flowers can be delivered right to her front door! 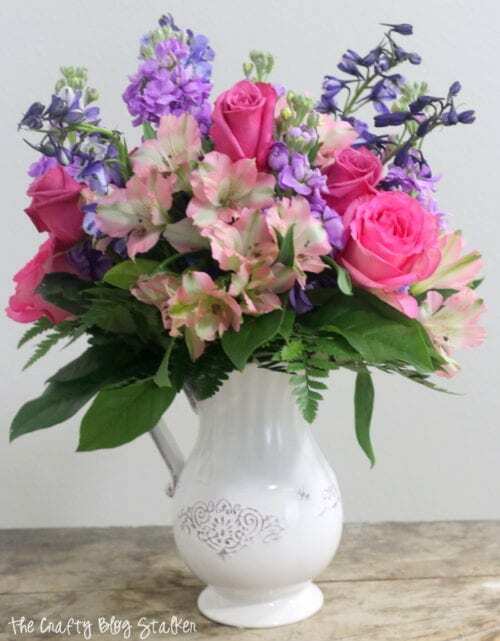 I ordered the Make Her Day Bouquet, isn’t it gorgeous?! 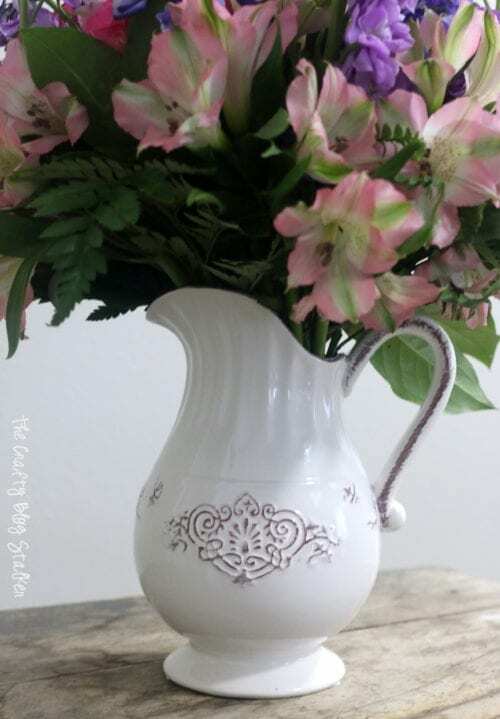 I knew the pitcher/vase would be a favorite part of the bouquet. AND they smell amazing! I just love that fresh cut flower smell that fills the whole room. 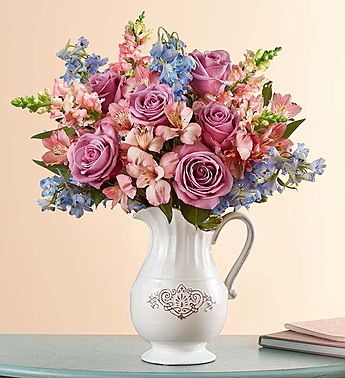 The best part, 1800Flowers has given me a special coupon code to share! You can save 15% on select Mother’s Day Favorites, simply enter code New15. You can choose from bouquets likeAbundant Love. or you can order the same as me, the Make her Day Bouquet. No matter what you get your mom for Mother’s Day this year, make sure to tell her that you love her. I bet you will see that gorgeous smile of hers, and you may even get to hear her laugh. 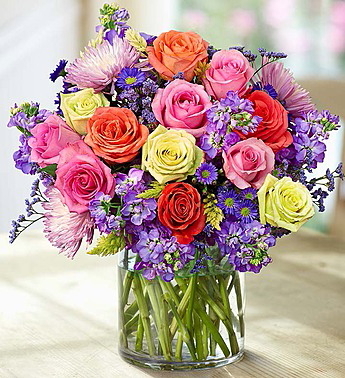 SAVE HAPPY MOTHER’S DAY TO THE BEST MOM TO YOUR FAVORITE FLOWERS PINTEREST BOARD! My sweet Katie. Thank you so much for this article. I didn’t know I laughed that much or that my laugh influenced you so much. You have made me feel like a celebrity! Thank you so much. You are most definitely one of my favourites! Happy Mother’s Day to you also. You gave me four wonderful grandchildren and you are an excellent mother to them. PS. Thank you for the beautiful flowers. 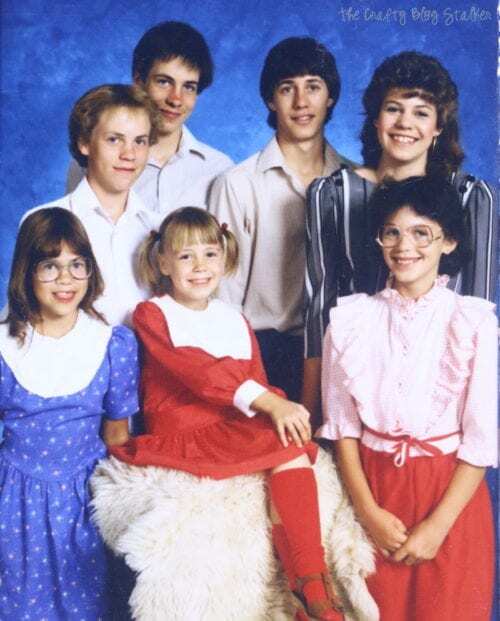 Your family photo reminded me of the enormity of my mom’s family. Every mom deserves such pretty flowers. Thanks for linking up with Funtastic Friday. Thank you for your kind words Victoria. Happy Mother’s Day to you too! Thank you Kellie. I kind of like my mom and think she is pretty special. What a sweet post. You’re right about your mother’s laughter. It’s beautiful! Thanks for sharing at Brag About It. The flowers are gorgeous. Pinning to my Mother’s Day Board.